A duck call lanyard is a piece of gear, often forgotten by many beginners in this sport. Duck hunting is as old as the act of hunting itself. There are cave paintings from 12,000 years ago with the act of waterfowl hunting, and waterfowl itself painted on the walls. Could you imagine trying to shoot a duck with a spear, or even bow and arrow? Not a compound bow either, and actual longbow. All I can say is “Good Luck.” These days, it is a traditional sport passed down through generations. The technology we possess these days is far greater, but ducks have grown more and more keen to all the tricks, we as hunters, have developed over the years. Now, we have the privilege of using shotguns, camouflage, motor-vehicles, and all the other advances that have been made. Duck calls are another one of these new advances that bring more ducks to the table. Once you get into duck hunting, and start seeing how many different calls there are on the market today, you will soon find yourself with several calls. Not just duck calls, either. Predator calls, crow calls, geese calls are all different calls you may find yourself with. Soon enough, your pockets will be spilling over with duck calls. Unless you get this, often overlooked addition to your hunting wardrobe: The duck call lanyard. The duck call lanyard is a fantastic, and relatively cheap piece of equipment any seasoned duck hunter has. There are more reasons than one might think to acquire this handy necklace. This is a familiar story to all who duck hunt. You just finished buying the last part of your gear, and it was a new duck call. It said on the package that it will call them in from near and far. Not only mallards, but woodys and teals too. So you head to that spot your buddy told you about, back behind Stony Brook, about a half-mile, to the clearing. You set up the blind, decoys, and start calling. At days end, you get a decent haul; two wood ducks and a mallard. The next day you follow the same routine, but only get one mallard. The next day you get nothing…what went wrong? Even if you are new to duck hunting, the need for multiple calls is a real one. No call can do every sound, all the time. Variety is an important tool in the duck hunter arsenal. It is true that beginners master one call at a time, and most seasoned hunters have their favorite call, but no call will work all the time. This is the first reason to have a duck call lanyard, to carry the various calls you will eventually acquire. Anyone who has hunted birds, even newcomers who have only a couple hunts under their belt, will tell you how still you must be when hunting any type of bird. This is because a birds eyesight is incredible. They actually see more colors of the spectrum than humans do, giving them superior sight and ability to spot movement. Having a duck call lanyard reduces movement by a significant amount. Think about it. You are out in the blind, using your favorite call to bring in some dinner. You call for a bit, and here them in the distance, but they just aren’t coming in. So, you dig in your pocket to get that new call to try. Your digging, and digging…oops, wrong pocket. In not too long, your standing up digging in every pocket trying to find it, when a flock moves in, sees you dancing about, trying to get your hands out of your pockets to grab your gun. By the time pull up and aim, they are gone. Another scenario is if your call gets jammed, or stops working for some reason and you have to switch quickly while they are flying in. Don’t get caught with your movement. This is reason number two to have a duck call lanyard: it prevents unnecessary movement. Another reason illustrated by this example, is to prevent losing them. The parts that make up a duck call can be fragile. Letting them clank around in your pocket with shells, cell phone, and whatever else those pockets may be filled with, can end in a useless call. Having a lanyard is a surefire way to keep them safe and sound, the way they should be. Many calls, even the less fancy, mass produced ones are hand tuned. This means that if you should happen to break your favorite, or, god forbid, your lucky call, buying the same exact one doesn’t always mean you will get the same exact sound (Or luckiness, for that matter). Yes, it is true that over time, calls will wear out. That does not mean that you should make that process happen quicker. Keeping those calls on a lanyard will prevent damage, and ensure they are on point when the time comes. Duck calls that are well cared for will call in far more ducks than the ones bouncing around in your pocket, or in your truck or ATV. This reason is not so lengthy as the others, but just as important to me as a hunter. Each hunting season, after a week or so in the field, I notice patterns of birds. They change from time to time, but may time I can decipher some of it. This helps me organize my lanyard the way that I need it. This may seem trivial, but to a serious hunter, nothing is really trivial. You can organize them by the areas you hunt, by the time of day or year, by species or any other way that you can think of. As I said, this may seem unimportant, but in my experience, being organized has always led to a better day hunting. Organization is the last reason for getting a duck call lanyard. These three reasons are the most important reasons to get yourself a duck call lanyard: The need for multiple calls for multiple species, the need to eliminate unnecessary movement, and to prevent breaking or losing them. While there are other, less important reasons that are different from hunter to hunter, these three are nearly universal. They are inexpensive, and are incredibly useful. I honestly believe that to be a successful waterfowl hunter of any kind, a lanyard is an invaluable piece of equipment. You could even make one yourself…if you feel the need to create. When it comes to the material your duck call lanyard is made of, you basically face to options. You could go for a traditional leather one or pick a somewhat modern alternative, a duck call made from nylon or other synthetic fabrics. While some people might prefer a leather one in terms of looks, others might find a paracord style nylon version more appealing. This obviously comes down to taste and preference, but there are other attributes you should take into consideration. Besides being a lot cheaper the nylon versions are usually a lot more durable. Leather requires more care and doesn’t resist to water as well as synthetics. If the nice leather look weighs out those arguments for you, by all means go ahead and get one. They served hunters well for centuries and still do, if you treat them right. A duck call lanyard is not really something you have to try before a purchase. 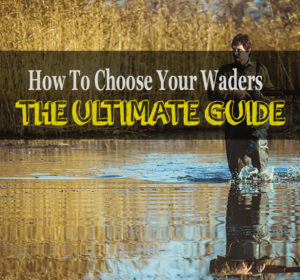 Unlike a pair of duck hunting waders, you can just go by looks and quality here. While I always recommend supporting your local stores, it’s the not the worst idea to check online stores. They tend to have way more products, coupled with reviews and rating which should give you an idea of what to expect.